Colorado West Ophthalmology Associates, P.C. was established in 1980 with the principal goal of provided quality eye-care to those living on the Western Slope. 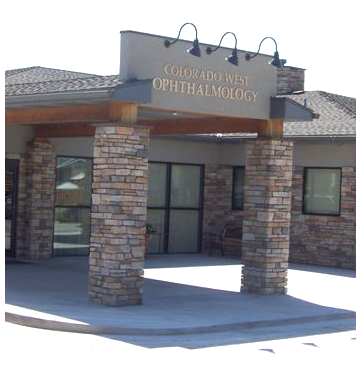 Throughout the years Colorado West Ophthalmology has continued to expand both its’ scope of practice and its’ clinical facility to keep pace with the population growth of Montrose and the surrounding area. During the late 1990’s, the old Montrose office on South Nevada Avenue was no longer of adequate size to continue offering our Western Slope patients the level of service they deserved. The availability of state of the art diagnostic and surgical equipment was expanding rapidly and a larger office building was needed in order to be able to offer these options. In early 2002, Colorado West Ophthalmology moved to the new clinical facility located just east of the Montrose Pavilion. In addition to the spacious reception and administrative area, there is a comfortable patient waiting area, ten fully-equipped exam rooms, a suite for minor surgery, and plenty of space for new diagnostic and therapeutic modalities. Colorado West Ophthalmology also maintains a fully staffed clinic in Delta. Both clinics have state of the art diagnostic equipment, including an in office laser, an Optical Coherence Tomography Scanner, digital photography, and an electronic medical records to facilitate accurate, reliable, and safe patient record keeping. The CWO physicians are adamant in maintaining and expanding eye-care services to Western Slope residents as Montrose and Delta continue to grow. We will continuously offer the most modern facilities for the diagnosis and treatment of eye disease. Peter M. Pritchett, M.D. joined the group in 1993. Among the current physici Paul D. Wiesner, M.D. has been in practice here since 1986. Nicholas Neubaum, M.D. since 2004 and Shad Saunders, M.D. since 2009. The new Colorado West Ophthalmology facility also houses Alpine Optical, winner of Montrose’s “Best of the Valley” award for optical shop 8 years in a row. Ken Linnenberger has managed Alpine Optical since the business began and still maintains longstanding and cordial relationships with clients. The ophthalmologists of Colorado West Ophthalmology perform over seven hundred cataract surgeries a year in both Black Canyon Surgical Center and Delta County Memorial Hospital. With the newly developed lens implant on the horizon, patients who undergo cataract surgery in the future may no longer need glasses for clear distance vision or reading. Ocular Coherence Tomography and avastin injections have transformed the treatment and prognosis for those with macular degeneration. Our in-office Argon laser facilitates timely treatment of retinal tears and holes, as well as diabetic retinopathy. Glaucoma patients receive the best possible care with automated visual field testing, Ocular Coherence Tomography, and access to modern laser and surgical treatment of glaucoma eye disease. We offer the most up-to-date soft and hard contact lenses as well as providing customized contact lens fits for those with conditions such as keratoconus. Here at Colorado West Ophthalmology we as well as our families feel fortunate to have the opportunity to live and practice in this beautiful area of Colorado. We enjoy the wonderful community of Montrose, the personal interaction with each of our patients, and the many exciting outdoor activities that are available nearby. Our doctors would like to personally thank both Montrose Memorial Hospital and Delta County Memorial Hospital for their unwavering support throughout the years. The greatest thanks goes to the thousands of patients who have been faithful to us for these thirty-five years. You have helped make Colorado West Ophthalmology both a successful and enjoyable endeavor. Our doctors look forward to many rewarding years ahead in the exciting medical and surgical treatment of ophthalmology.